Interoperability, sustainability, and cost-effectiveness are cornerstones for evolving technologies in justice information sharing. The Global Standards Council (GSC) stands as a gatekeeper to ensure that technical products developed in the national justice community evolve in a cohesive manner so that consumers find a single set of products that are known to work well together and reinforce one another. The GSC’s mission is to coordinate the broad-scale electronic sharing of pertinent justice and public safety-related information by coordinating the establishment of a common, consistent, and standards-based approach to implementing justice information sharing solutions. The GSC is responsible for the development and maintenance of normative information sharing technical exchange standards, including proposed standards submitted by consumers and stakeholders. 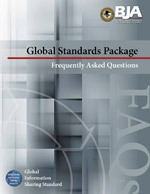 For more information on the GSC, please visit the Global Standards Council page at https://it.ojp.gov/gsc. To achieve the interoperability and cost-saving aims of the GSC, the Global Standards Package (GSP) was developed. The GSP is a collection of normative, independently versioned standards that are assembled into a package of composable, interoperable solutions specifically supporting the exchange of justice information. GSP solutions are generally technically focused but also may incorporate associated guidelines and operating documents that include instruction and education, policy recommendations, and tools and templates. GSP deliverables also include artifacts associated with many of the Global product areas, including topics centered on Data, Messaging, Architecture, Access Control, Authentication, and Federation Management. NIEM helps to eliminate confusion associated with different data definitions across law enforcement and public organizations by providing a common vocabulary to ensure consistency and understanding among state, federal, and local agencies. For more information on NIEM, please visit https://www.niem.gov/. The GRA offers guidance on the design, specification, and implementation of services and related infrastructure for organizations that are looking for an architectural solution to sharing information through external exchanges and common messaging standards between information sharing systems. For more on the GRA, including access to free online training, visit https://it.ojp.gov/initiatives/gra. Reference services that serve as the means by which the information needs of a consumer are connected with the information capabilities of an information provider. Developers, architects, and service authors are strongly encouraged to refer to the following namespace site when developing Global service specifications. This namespace provides a collection of names, identified by uniform resource identifiers (URIs), which are used to support GRA service specifications, service specification artifacts, packaging metadata, and sample documents. The GFIPM specifications and guidelines are designed to support security controls when accessing justice information systems, based on commonly understood and applied user access control policies. The technical privacy framework is a methodology and series of tools designed to support defining the data privacy and confidentiality rules and disclosure obligations based on various roles and conditions. “In order to promote information sharing and enable interoperability among disparate systems across the justice and public safety community, OJP requires the grantee to comply with DOJ’s Global Justice Information Sharing Initiative (DOJ’s Global) guidelines and recommendations for this particular grant. The grantee shall conform to the Global Standards Package (GSP) and all constituent elements, where applicable, as described at: https://it.ojp.gov/gsp_grantcondition. Compliance with the GSP requires conformance to all components of the GSP whenever applicable. If the grantee is planning to exchange information across agencies or systems using a common data format, such format is required to be conformant to the National Information Exchange Model (NIEM). If the grantee is planning to adopt a service-oriented approach to sharing information, it must leverage the Global Reference Architecture (GRA), and so on. If the grantee is planning to establish a single-user identity and privilege system across domains, the Global Federated Identity and Privilege Management method should be employed.